Pembroke Welsh Corgi Dogs - The Pembroke Welsh Corgi is one of two dog breeds known as Welsh Corgis that originated in Pembrokeshire, Wales. These herding dogs are believed to be descended from Swedish Vallhund dogs that came to Wales with the Vikings. The phrase "cor gi" is frequently translated as "dwarf dog" in Welsh. The Corgi is actually the smallest dog in the Herding Group. Like most herding breeds, they are active, intelligent, and athletic dogs despite their short legs and stocky body. The short legs may seem to be a disadvantage, but they can run and jump just as well as any other dog of comparable size. They were originally used to herd sheep, horses and cows by nipping at their heels. Its low profile allowed it to roll away from a cow's kick. Though still sometimes used as a working dog, today they are more commonly kept as companions. A Pembroke is between 10 and 12 inches (250 to 300 mm) tall at the withers (tallest point in the shoulders) and weighs no more than 30 lb (15 kg); dogs in peak condition weigh about 27 pounds (12 kg) for the male and the females are about 2 pounds (1 kg) lighter. Pembrokes can be red, sable, fawn, or black and tan (tri color) with or without white markings on the legs, chest, neck, muzzle, underneath, and as a narrow blaze on the head. There are technical names for these Tri Colors, and they are Black Head Tri, and Red Head Tri Color. Too much white is not acceptable for show dogs. Historically, the Pembroke was a breed with a natural bob tail (very short tail). Due to the advent of docking, the trait was not aggressively pursued, with breeders focusing instead on other characteristics, and the tail artificially shortened if need be. Given that some countries are now banning docking, breeders are again attempting to select for dogs with the genes for natural bob tails. 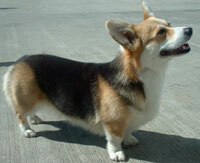 Corgis have a short undercoat as well as a longer thicker overcoat. These coats shed continuously all year round, with extensive seasonal shedding occurring at least twice each year (as well as after the weaning of pups in the intact females). These dogs are amazing companions for children, bonding more with them than they might other members of the family. Pembrokes are extremely intelligent and quick thinkers, which can make them easy to train, but they are not subservient â€” for instance, they might not respond to "come" if they have found something such as a gopher hole that interests them more than the reward offered. Pembrokes are quite obedient, because of its want to please the owner. In training, the most success has been found using treat-based praise as the Pembroke has an insatiable appetite to a fault. This information is licensed under the GNU Free Documentation License. It uses material from the Pembroke Welsh Corgi article on Wikipedia.org. Pembroke Welsh Corgi Breeders - Advertise your kennel puppies and dogs here. Double Rockn's Ranch - California - ~Bred For Excellence~ All of our Corgis are CH titled and family pets also! 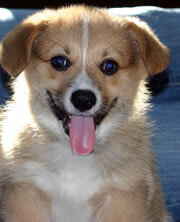 Corgis 4 You - We have 1-3 litters a year. All our dogs & puppies are AKC registered. Our puppies are raised inside from day 1 & leave pre-spoiled & full of love. They all come with full AKC registration, copy of parents pedigree, health guarantee, & puppy pack. We fell in love with the breed & so will you.